Maddie & Sadie taking a bath together. Sadie's red chair broke and this is what I found when I came back from getting a screwdriver to fix it. Sisters. 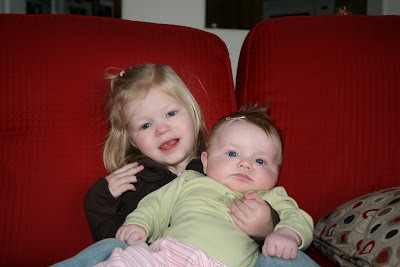 Sadie loves to hold Maddie. 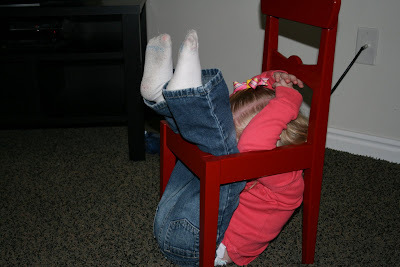 Oh, Lindsey -- I laughed so hard when I saw that broken chair picture! WHAT A CUTIE! I agree with Sara! That picture is too much. Sadie is such a little ham! I love it! She is so good with Madison it looks like. These are CHOICE! Maddie and Sadie will now occupy a place of honor in our bathroom hall of fame. Sadie in the chair is unbelievable! 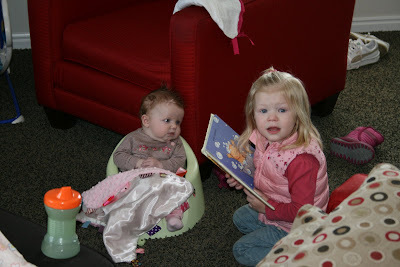 And Maddie appears to be listening so intently to Sadie's reading. 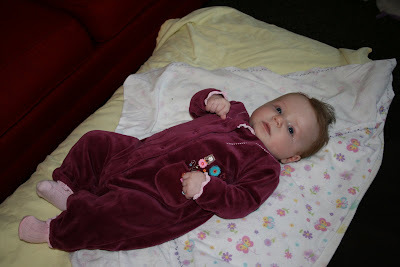 Oh, and I think Sadie is flashing a gang sign while she's holding Maddie on the sofa.